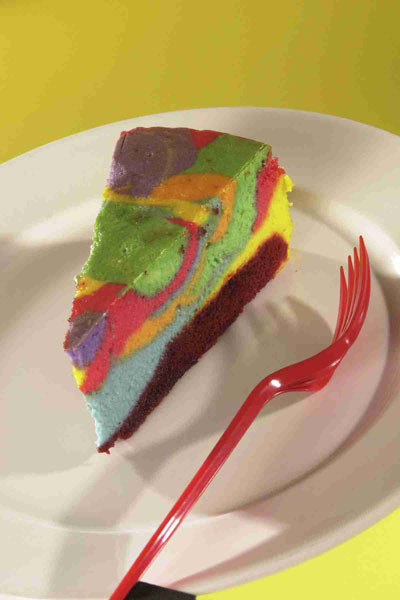 One of the things the resort we will be staying at features is the famous Tie-Dye Cheesecake. The ONLY place you can find it at WDW is at the Pop Century resort. Doesn't it just look fun!? The "crust" is made of red velvet cake! The cheesecake part is just like any other cheesecake, except you color it with food color. Preheat oven to 350 degrees. Grease the bottom and sides of a 9″ spring-form pan. Cream together butter, sugar & eggs. Make a paste of cocoa and food coloring. Add the paste to the creamed mixture. Mix salt & vanilla in buttermilk & add alternately with the flour. Mix soda & vinegar separately, add last, folding in. Do not beat after adding soda mixture. Pour batter into prepared pan. Bake at 350 for 30 minutes or until tester comes out clean. Cool cake in pan. NOTE: All above ingredients should be at room temperature before you begin. Start by beating the cream cheese until light & fluffy. Keep mixer on a low setting throughout beating and mixing process. Add the sugar a little at a time & continue beating until creamy. Add one egg at a time and beat after each egg. When eggs have been mixed into the cream cheese add flour, vanilla and lemon juice, mix well. Add the sour cream last & beat well. To assemble, drop large spoonfuls of the colored batters randomly on top of the red velvet cake still in the pan. Swirl each layer slightly. Place on the top rack in the middle of a 325 degree preheated oven for one hour and 15 minutes. When time is up, prop open oven door and leave the pan in the oven for one hour. After one hour, remove from oven. Let cool enough before the cheesecake is put into the refrigerator for 24 hours. Once I get my kitchen back to normal I plan on making this. I will let you know how it turns out! Have you had the TDCC at POP or made it yourself?